There were a bunch of bridemaids and Michael was the best man. They all looked so handsome in their suits. Especially my man! :-) I was one proud wife! It was so fun to see them...married! They dated a little in high school but things didn't work out. Then when he was 19, he went on a mission and she decided she wanted him back! They wrote each other the rest of his mission and she waited for him to get home and the rest is history! We couldn't believe they lasted such a long engagement but they wanted to wait for Alyse to get home. That was nice of them! We all were outside taking pictures for a while. The weather was perfect! We were a little worried earlier in the week because it was cloudy/rainy off and on. But the sun pulled through and most of us even got a little sunburned! Gorgeous. I love the yellow very bright and springy. Love the yellow bridesmaid dresses! 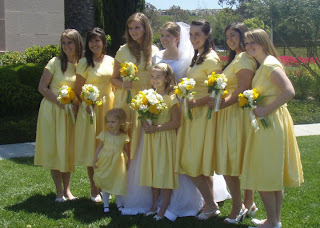 My sister wore yellow as my maid of honor - so summery! I have to say this: You ARE young! Hahaha. But I get what you are saying just the same. I love the picture of the baby. So sweet.